Hyatt Regency Kolkata, one of the finest 5 star deluxe business hotels in Kolkata. It is located 15 minutes drive from the Kolkata Int'l airport and down town. The hotel is also just 10 minutes’ drive from IT hub of Kolkata (Sector V & Eco Space - Rajarhat) makes the most convenient hotel for business travelers. This hotel is also offers facilities like highly flexible meeting spaces and event venues for corporate meetings, cocktail evenings, exhibitions and wedding venues and business center. The banqueting and conference space include a pillar less Regency Ballroom, outdoor Regency Lawn and best conference halls in Kolkata. This is the best business hotel in Salt Lake, Kolkata, appointed with state-of-the-art technology infrastructure offering broadband connectivity and Wi-Fi, technology and meeting concierge, recessed projector screens and light racks, along with a dedicated events services team at your service to ensure the success of every event. For such busy hotel who are offering so much to their guests, its not necessary to mention that their restaurants or eateries will be also state-of-the-art. 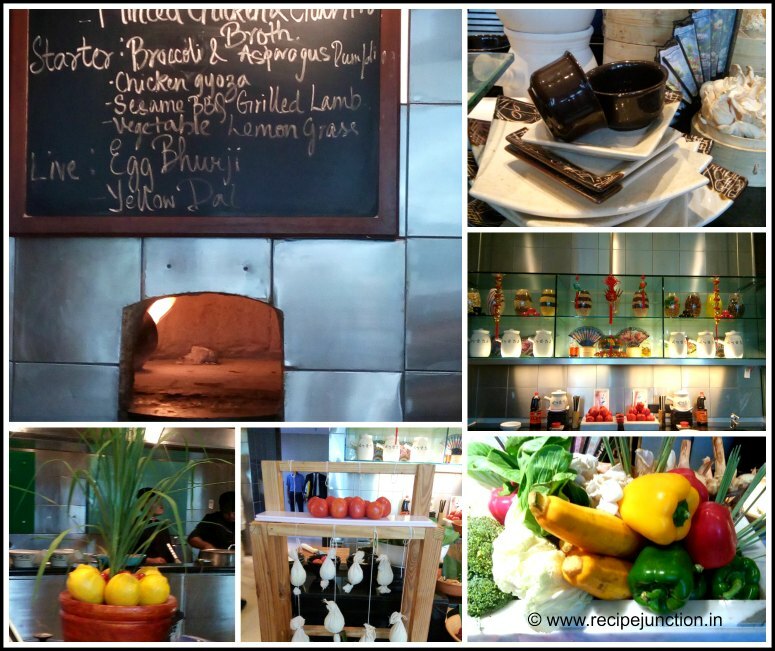 Hyatt Regency has three restaurants - Waterside Cafe, Guchhi and La Cucina. From a world cuisine to authentic Italian or a true taste of Indian delicacies, the hotel offers various choices for all kinds of guests. 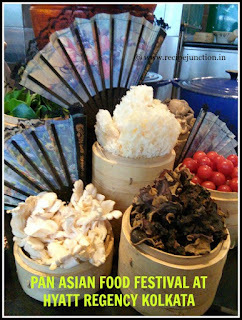 Few days back I was their Waterside Cafe on invitation to preview their ongoing Food Festival "Pan Asian Food Festival" representing my blogger group, "Kolkata Food Bloggers". This festival have strted from 22nd September and will go on till 2nd October. The Waterside Café at Hyatt regency, Kolkata a spacious and stylish 24hours café located at the ground floor is famous for the beautifully landscaped gardens and water view of the property. Its high ceiling overlooks the atrium lobby, floor to ceiling window overlook the fountain and pool side. Relaxed sofa lounge seating along with regular comfortable and stylish sitting arrangements are available for guests to witness a classy world cuisine throughout the day. 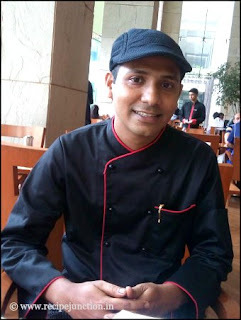 Waterside Café is considered as one of the famous restaurants in Kolkata by the foodies. 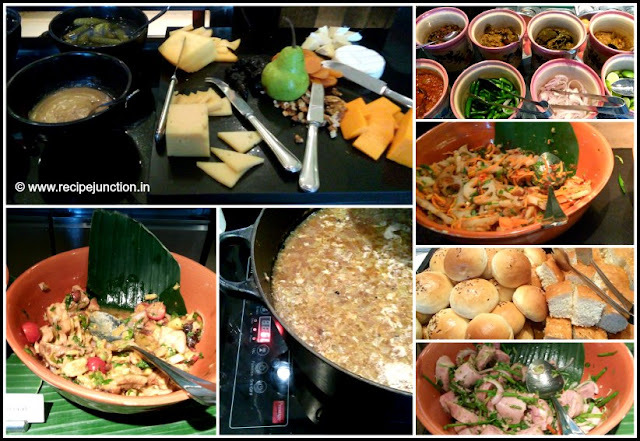 Guests go gaga for the range and variety of the buffet lunch and buffet dinner in Kolkata. The breakfast layout is guest’s favorite. 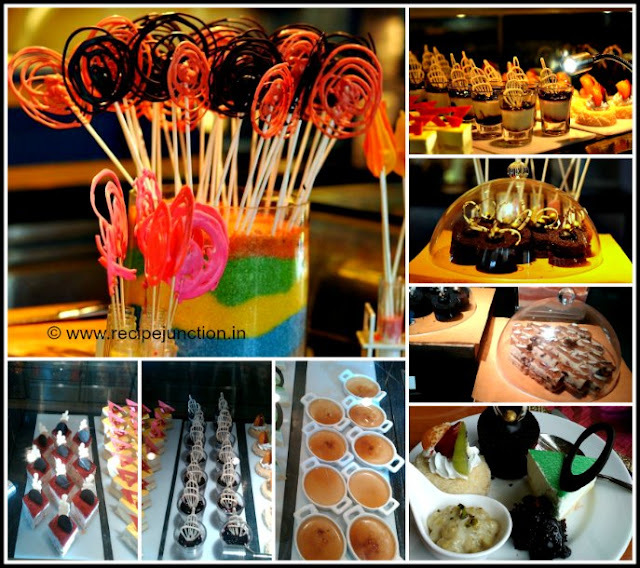 Overall with such an interesting food spread, Waterside Café is considered as one of the best buffet restaurants in Kolkata. I was amazed to see the elaborate spread Waterside Cafe has planned for the festival. House Chef Bikram Das, who has joined Hyatt Kolkata recently after serving in Hyatt Bangalore was very courteous and totally down-to-earth person. 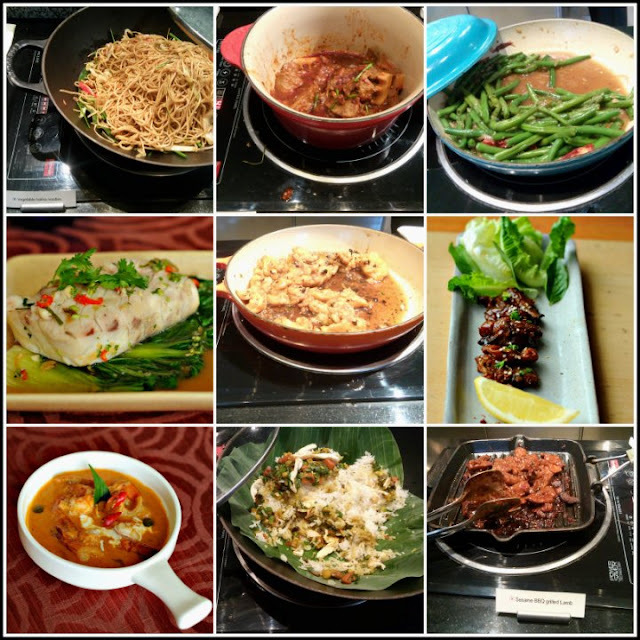 He has shared his experiences with us and how he have learnt Asian cuisines in details. Then he shared that the buffet will consist of soups, salads, starters, main coarse and dessert. In all categories there will be enough option for Veg as well as non-veg people. 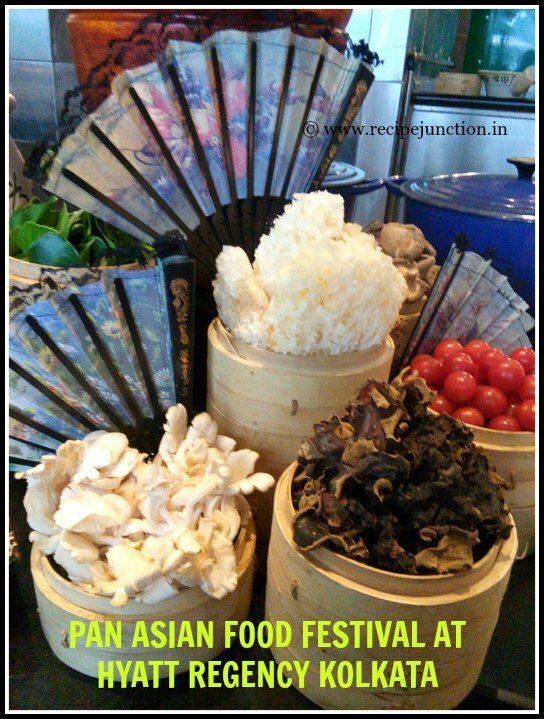 As the buffet is showcasing Pan Asian Cuisines, so the buffet spread will cover most of the Pan Asian country cuisines like, Chinese, Thai, Vietnamese, Japanese, Indonesian and off course Indian cuisine. The buffet is for everyday lunch and dinner and also for Sunday brunch. The price is 1650 plus taxes per person. 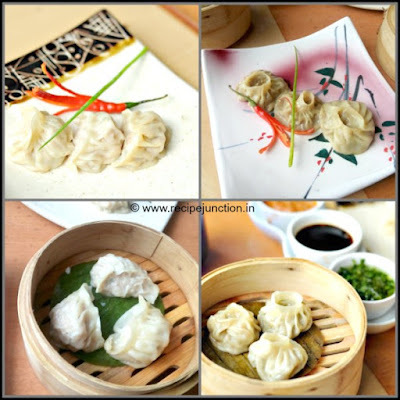 In appetizer, we were served Chicken Gyozo and broccoli & Asparagus Dimsums and both tasted awesome. Hyatt has a huge variety of salads for the event and all were better than the others. Okra salad was one of my favorites. In soups, there were Tom Yum Soup with vegetables and Chicken and cilantro broth, both were really appetizing. In main course they have huge array of dishes prepared for the event. Jasmine rice with tofu and vegetables, hakka noodles, Sesame BBQ Grilled lamb, Shower fried fish in black bean sauce, Saigon Beef, Stir fried Asian green, Wok tossed haricot dry chilli and Kaeng Phet Koongat or prawns in creamy and spicy gravy are some of the delicacies from allover Asia being served there and I'm sure you're already drooling seeing these delicacies. So, don't wait any more and Visit Hyatt Regency, Kolkata, just beside Salt Lake stadium, Kolkata. In desserts they have everything from cakes, mousse to Creme Brule. Final Word :: I'll recommend everyone to visit Hyatt this week and savour these awesome delicacies prepared by chefs in Hyatt, Waterside Cafe for lunch and dinner buffet(from Mon-Sat) and for Sunday brunch. This is a once-in-a-lifetime opportunity for Kolkatans to enjoy so many varieties of Asian dishes under one roof.